Maestro Dr. Premasiri Khemadasa will be best remembered for his film music and symphonies like Maha Muhuda (The Sea), Mage Kale Mavuni or Mother of my Time (Dedicated to his mother), Pirinivan Mangalya (A Buddhist Requiem), Beyond Horizon. Beyond Horizon was specifically composed for Voice and Chamber Orchestra, written for the Chamber Music Society of Colombo. The first performance was held at Temple Trees. Apart from his Sinhalese operas like Manasawila, Doramandalawa and Agni, maestro Dr. Premasiri Khemadasa is best remembered for his music scores for Dr. Lester James Peries's Nidhanaya (The Treasure) and his last film Ammawarune (Elegy for a Mother), Golu Hadawatha (Silence of the Heart), and Dharmasiri Bandaranayeke's Thunveni Yamaya and Jayantha Chandrasiri's Agnidahaya. He composed music for films and teledramas of three generation of cinema and tele-drama directors. The long list ranges from Jayantha Chandrasiri's Dandubasnamanayato young Devinda Kongahage's Sadisi Tharanaya. His symphonies like Maha Muhuda and Mage Kale Mavuni will remain as masterpieces not only of Dr. Premasiri Khemadasa but also of contemporary Sri Lankan music. Perhaps, his signature and forte in composition is sheer amalgamation of conglomerate of diverse traditions of music in his quest for creating indigenous music diction. Early part of maestro Khemadasa's life would not have been filled with dramatic events until he concluded his formal education to commence his trailblazing career as a member of the SLBC orchestra. He received his formal education from Sri Sumangala College and St. John's College, Panadura. Although he was not exposed to music until the age of 11, he soon grew an abiding love for music, playing flute, piano and accordion at the time. It was kind of vogue at the time to learn musical instruments. However, the turning point in maestro Khemadasa's life was his joining the SLBC orchestra which led him to compose music scores for films. Khemadasa, the composer was born with his debut music scores Sirisena Wimalaweera's Roddie Kella. We could still remember how enthusiastically Maestro Khemadasa reminded of those who made an immense contribution to his works including late Malani Bulathsinghala, Amerasiri Peiris and Lakshman Joseph de Saram when we met him while composing music for Devinda Kongahage's tele-film Sadisi Tharanaya. 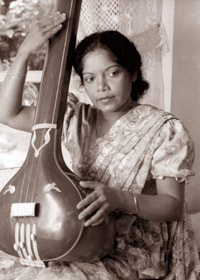 Malani Bulathsinghala and Amerasiri Peiris are best products of the University of Visual and Performing Arts and made immense contribution to the field of music.Khemadasa particularly mentioned Malani Bulathsinghala's concert 'Maa Da Obamaviya' and the film 'Madhu Samaya'. Maestro Premasiri Khemadasa would have been fortunate to have accomplished entourage in his journey for excellence. Amerasiri Peiris and Lakshman Joseph de Saram are well versed in both oriental and occidental traditions of music. Amerasiri Peiris though engaged in oriental music, is equally at home with many traditions of music. It should be mentioned here that Dr. Khemadasa's mastery in many traditions enabled him to compose music which is distinctively Sri Lankan in character with universal appeal. Although the influence of Western music was predominant in Dr. Khemadasa's music, he was not reluctant to borrow and integrate traditional note motifs from drums of Sri Lanka. Sumithra Peries remembers as a born genius. "I have known Dr. Khemadasa from his early days. I found his music creations for Golu Hadawatha and Nidhanaya were very important. It was before him experimenting with symphonic music and with cantatas. The melodies of Golu Hadawatha are timeless; they were not songs like preamble for his symphonies. Even though it was for the film; he must have been experimenting with the sounds. As he progressed, he was developing extra ordinary talents he had. One would think most important elements are melody and also harmony and tonality. As he progressed, melody I think went more to the background. The melodic sense developed in more populist way. I think his tonality of sound developed much more and he had a kind of very energetic kind of music idiom which I do not know anybody else, certainly has not in our Sri Lankan musical landscape. So I think in his case, he was basically very committed man. He took very freely all the disciplines; North Indian Classical Music , local music, folk music, traditional music or Western classical music . He had melodic patterns and rhythms that textured quality of his work. I think with time and experimentation, he found music for a film was limiting his talents. He was, possibly, the inborn genius and that he brought to fruition and in the process he was neglectful of his personal health. In the future, he will be remembered and his music will remain timeless and state-less and modern-ness will survive with time. At Janakala Kendraya in Battaramulla, Maestro Khemadasa recalled how generous Malani Bulathsinghala was when it comes to recognizing talents. She once introduced a young student and requested Master Khemadasa to take him into his fold as the student was so accomplished it was best for master to coach him. It was rare that a teacher would hand over his or her best student to another teacher though that student may profit from it. Maestro Premasiri Khemadasa's composing music score for Dr. Lester James Perie's Nidhanaya was not only a turning point in his career but also watershed in the Sri Lankan film music. Nidhanaya which was based on a short story of the same name by G. B. Senanayake became the best Sinhalese film in the history. No other Sinhala film, so far, has been clever enough even to come close to it, in terms of cinema language. 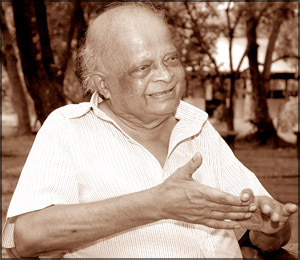 Maestro Premasiri Khemadasa's music scores intensified the zest and contributed to the overall success of the film. His fruitful collaboration with Dr. Lester James Peries lasted for eight films including Lester's last film Ammawarune. Once a world famous critic on music described Pirinivan Mangalya (A Buddhist Requiem) by Maestro Premasiri Khemadasa as the most important creation stemming from South Asia. It was no wonder that the pious rituals performed at the passing away of Buddha in the royal garden of Kusinara. Flowers of rain fell on in homage of Buddha and gods performed miracles. The atmosphere was filled with piety as pyre of sandalwood lit up. Amazingly maestro Premasiri Khemadasa captured the essence of ceremony in a magical spell of notes.